"It is written: 'I believed; therefore I have spoken.' With that same spirit of faith we also believe and therefore speak." Jan DeChambrier, featured speaker at the BreakFree Christmast Series, spoke on "JOY: Sorrow Turned Inside Out", sharing excerpts from Glimpses as well as other testimonies. In two parts about 32 minutes each. Sts. Peter and Paul Catholic Church in New Braunfels recently hosted an ecumenical gathering of hope and healing attended by members of more than a dozen area churches. 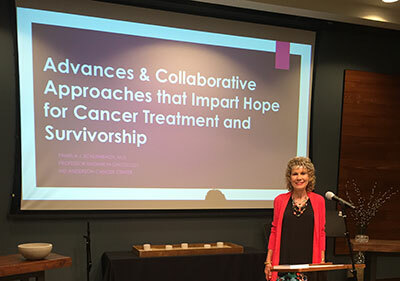 Cancer Survivor, hospital chaplain, and member of The Woodlands United Methodist Church, Jan de Chambrier, delivered an inspiring message entitled, “Celebrating Life: On Earth as It Is In Heaven” on April 21st, the birthday of her friend and co-author, Carrie Olivier. Carrie, who lost her battle with cancer on earth five years ago, would have been 53. Listen to the KHCB Christian radio network broadcast interview of Jan and Dr. Gary Oliver speaking to Bruce Munsterman about the GLIMPSES book and Glimpses of Hope ministry. 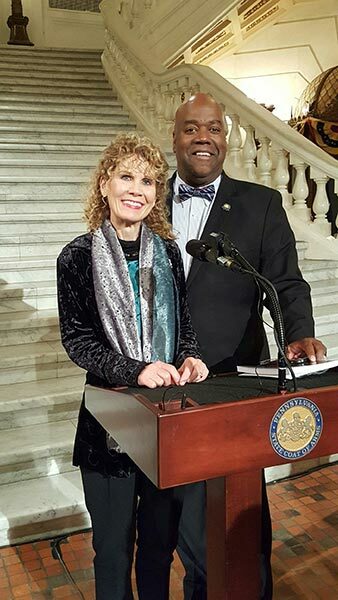 Recipient of Golden Rule International Award from Ambassador Clyde Rivers, Pennsylvania State Capitol, January 30, 2016. One of my greatest joys is to share testimonies of how the Lord has worked in my life - from the mundane to the miraculous! “For the testimony of Jesus is the spirit of prophecy.” (Revelation 19:10) If you have a favorite chapter in Glimpses, I would welcome the opportunity to enlarge its parameters and speak to your church group, cancer support group, women’s retreat, or just about any other venue. You’ll find the Table of Contents in “Our Story.” Choose one topic - or several! I love to combine the spoken word with my love for music and my call to prayer. “Near to the Heart of God” combines testimony, inspirational hymns and praise songs on the piano, and prayer to lead the listener to a more intimate relationship with Jesus. "Celebrating Life: On Earth as it is in Heaven" combines Jesus' teaching of the Lord's Prayer to His disciples in Matthew 6 with excerpts from Glimpses to illustrate that we can experience HIs Kingdom in the here and now, even in the midst of trials. This works well as a preface to a service of prayer and healing. “Savior, Like a Shepherd Lead Me” illustrates the words of Jesus in John 10:27 - “My sheep listen to my voice; I know them, and they follow me.” Find freedom in Christ through learning to be obedient to His voice. “Nothing but the Blood of Jesus” delves into the correlation between the “guilt offering” of the Levitical law and the New Covenant blood of Jesus, bringing us to the full comprehension of forgiveness. Thanks for your interest in having Jan attend your event. Guest Speaker, "Celebrating Life: On Earth as it is in Heaven"
Guest Speaker, "Joy: Sorrow turned inside out"